Join us to create ‘Monsters of Bedford’ at The Drawing Room at 22 Castle Lane (formally known as the Bridal Boutique in Castle Quay) from 11am – 3pm on Saturday 22nd October 2011. As part of the Big Draw 2011, people of all ages are invited to join professional Bedford illustrators Katy Dynes, Alasdair Bright, Rachel Lovatt, Marisa Straccia, Scarlett Tierney, Andrew Foster and David Litchfield in a day of fun and informal drawing. 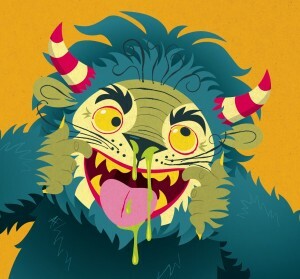 Taking inspiration from the creatures that have existed in the area from prehistoric time to the present day, people are invited to create their own monster drawings. Illustrators will be on hand throughout the day to demonstrate a wide range of drawing techniques ranging from the use of pen and pencil to chalk and stitch. Participants can add their creations to the ‘Monster Map’ of Bedford which we will create on the walls of The Drawing Room. This is a drop-in event and is open to all. Children are very welcome but must be accompanied by an adult. Attendance is free but donations towards materials are welcome. Thank you so much for this event! My daughter Abigail (6.5 years) stumbled upon the event when exploring the Castle Quay area. I know I enjoyed creating my monster as much as Abigail did and she was very keen to enter the competition. Just imagine her excitement when we collected a beautiful package from the post office this morning to find her second place prize inside! She has positively bounced into school this morning desperate to show everyone her framed artwork that she had already told them about creating last week. She will share her achievement with the whole school in their sharing assembly on Wednesday morning – if she hasn’t already told everyone before then! Thank you for this wonderful creative opportunity and for the encouragement this has given my daughter.